Today's post is part of a "tarot blog hop" honoring Yule or the Winter Solstice and carrying the theme of "turning darkness into light." Some may have come upon this page after reading Chloe's Yule post over at TABI. And when you're done reading my post, please visit Stella T'arot's Yule post at US Games. In this manner, readers can "hop" to each of the 26 blogs participating in this blog hop. 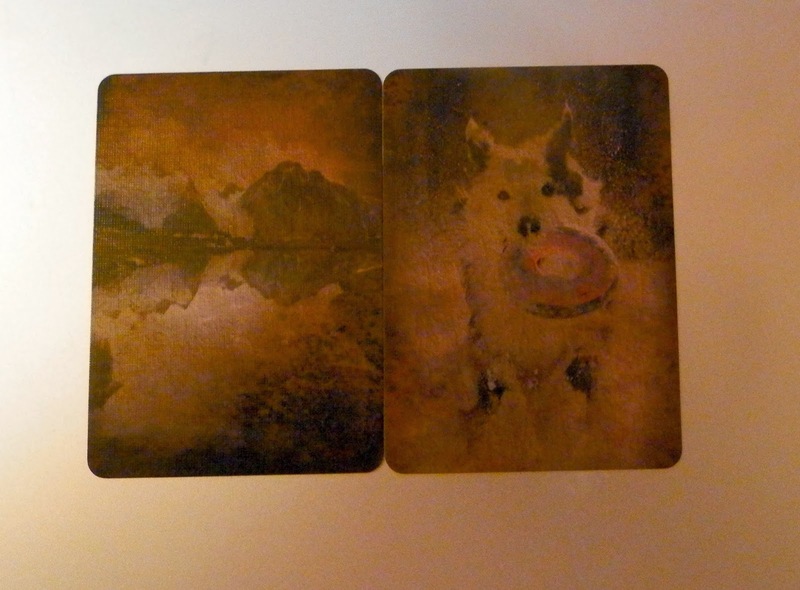 Today’s Draw: Mountain + Dog from the Natalie Rose Winter Solstice Lenormand by SevenStars. Is there a lot of darkness in your life right now? Are you troubled by the darkness in the world? How long has it been since you've recharged the battery in your own light? OK. It's not tarot and this is a tarot blog hop. But the deck was made specifically for the winter solstice, so I couldn't resist. And I'm glad I didn't resist because the Lenormand gave me the perfect answer for how to turn darkness into light: Trust. Trust that you will overcome your obstacles. Trust that the obstacles have entered your path for a reason. And trust that whatever darkness has enshrouded you is temporary and something you are capable of coping with, seeking help for or turning around. That's more for darkness of a personal nature—an illness, loss or depression, perhaps. But this draw also has an answer for the sort of darkness that pervades society. It asks us to be kind. Kindness is a light from which no darkness can escape. It sounds simple, but it's not. Because it means being kind to those who have hurt you. It means being kind to yourself. The dog is the quitessential symbol for kindness because dogs hold no grudges. They radiate nothing but love, even for the hand that strikes them. And while most of their love is given to the human in their life, they take time out every day to groom themselves, get their needs met and seek out love to receive. In other words, they are kind to themselves, too. When you add it all up, you and your higher power are a dynamic duo and an unbeatable force for light. By trusting in the universe and exhibiting kindness, you can not only pierce the darkness, but you can also keep your energy from being lowered by the darkness around you. Because darkness can be a tricky thing. It will lure you by pushing your buttons and dragging you into its energy. However, it can't do that if you treat it with kindness. Compassion. Or forgiveness. It feels "unnatural" to greet hate with kindness at first. Your sensibilities will fight it. But when you make a practice of it, you will feel the shift inside and it will trigger shifts outside of you, too. Recently there's been a lot of talk of racism and homophobia on the heels of comments made by a reality TV star. When you greet name calling with name calling, you become the thing you object to. And you trigger them to keep fighting back. When you greet it with kindness and compassion, you leave space for the other to think about what they're saying about such a kind, compassionate person. When you're being understanding, you leave space for a discussion, instead of a fight. The other may not always be receptive, but your energy won't go unrecorded. Darkness is out there. It's all around us. And it persists because we greet it with darkness. We feed it. Fatten it. Poison our bodies with it. But the solution is clear. Ask yourself WWDD (What Would Dog Do). If dog attacks, he affirms the other's ire and suffers the consequences, even if the other cast the first stone. If dog licks hand, his kindness can shame the other into making different choices. It doesn't happen overnight. It may not work on everyone. But neither of those things matter as much as the effect kindness has on your own soul, karma and, more importantly, wattage of light. If you are the only one bearing light, shine so bright everyone can see, and trust that others will follow. Now that you're done reading my post, feel free to "hop backward" to Chloe's Yule post over at TABI or forward to Stella T'arot's Yule post at US Games. Or if you really want to be wacky, view any of the 26 blogs participating in this blog hop. Fabulous post as usual Tierney!! Trust and kindness are so incredibly important. and WWDD??!!! LOVE LOVE LOVE. LOL Ellen, I do the same as well. Beautiful post and message. <3 Thanks for sharing the deck, too, it's lovely! Love of self leads to love of others. Always works. I think of the dog, which loves its pack more than its own individual life, but that doesn't mean it doesn't love self. Think about that balance. Excellent reminder, Tierney. Thank you! Thank you for this Tierney. 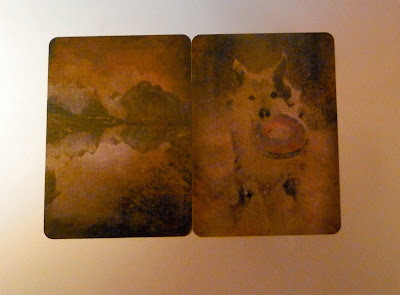 I am just now learning the Lenormand...so this perspective of the Dog is so meaningful to me. I do need to remember to be kind to myself. A very good reminder about that balance... and thanks for introducing me to a new deck! WWDD? Love it! That will stay in my mind always :D Thanks! Joanna, Dog is loyalty, trust and friendship, just like a real dog. The nice thing about Lenormand meanings is that there is a logic to most of them. In this reading, we focused on turning darkness to light, so the combo might literally read "trustworthy obstacles", which led me to "trusting that the obstacles are there for a reason". This uses the strict traditional interpretation method of the first card being the noun and the second being the adjective. In my second interpretation, I loosened it up a little to be more of "greet challenges with love and friendship". Mary Greer recommends that, while you're first learning, to use this method of the first card is always the noun and second the adjective, just to get in the habit of thinking that way. If I were teaching Lenormand, I would also say to learn the traditional methods and meanings first. And then once you're comfortable with them, you can add your own personal touches and meanings. For example, the Tower usually speaks to a large corporate entity or government...some type of authoritarian entity. While that never leaves my mind, the Tower seems to come up to me in areas that speak of independence and standing alone. So if the second, made up and non-traditional meaning fits, I use it. These personal associations we make with particular cards are important because they help form the language the cards speak to you in. But with Lenormand, as with tarot, learning the foundation and intended meanings of the cards is essential before veering off-road. :) I know you didn't ask for this, but thought I'd share my philosophy. So much of learning about Lenormand is cobbled together from various sources right now. Only since Caitlin Matthews' deck came out has there been a book worth reading. Soon Rana George's will be out and it will, no doubt, be a goldmine of information for all of us. Excellent post, Tierney. I really appreciate the attitude of treating meanness with kindness. It is not easily done and sometimes I must turn my back to the meanness rather than approach it at all. I am going to reflect on your post quite a bit more. Thanks, Arwen. You're right that it's not easily done. But when I've done it, I've discovered so much about the person I'm being nice to....stuff I would never see if I decided to walk away or make it a fight. Nobody is just one thing. It's easy to demonize others so we don't have to think of them or be around them. I'm a big walker swayer, too...I rarely ever fight. But making an effort to be kind, and genuinely so, has resulted in getting kindness in return, seeing a different side of things and really just understanding life and people better. Like all things we do with love, it benefits the giver the most. But it really benefits everyone and moves humanity closer to "being the change we want to see."